With eye tracking being increasingly integrated into virtual and augmented reality (VR/AR) head-mounted displays, preserving users' privacy is an ever more important, yet under-explored, topic in the eye tracking community. 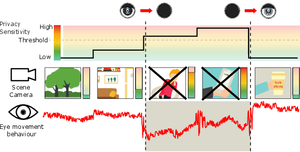 We report a large-scale online survey (N=124) on privacy aspects of eye tracking that provides the first comprehensive account of with whom, for which services, and to which extent users are willing to share their gaze data. 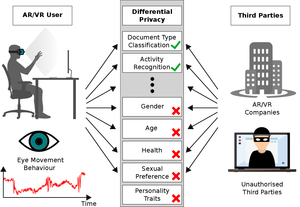 Using these insights, we design a privacy-aware VR interface that uses differential privacy, which we evaluate on a new 20-participant dataset for two privacy sensitive tasks: We show that our method can prevent user re-identification and protect gender information while maintaining high performance for gaze-based document type classification. Our results highlight the privacy challenges particular to gaze data and demonstrate that differential privacy is a potential means to address them. Thus, this paper lays important foundations for future research on privacy-aware gaze interfaces. With an increasing number of users sharing information online, privacy implications entailing such actions are a major concern. For explicit content, such as user profile or GPS data, devices (e.g. mobile phones) as well as web services (e.g. facebook) offer to set privacy settings in order to enforce the users’ privacy preferences. We propose the first approach that extends this concept to image content in the spirit of a Visual Privacy Advisor. 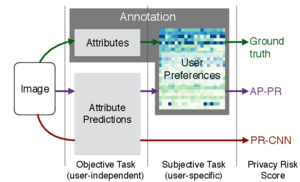 First, we categorize personal information in images into 68 image attributes and collect a dataset, which allows us to train models that predict such information directly from images. Second, we run a user study to understand the privacy preferences of different users w.r.t. such attributes. Third, we propose models that predict user specific privacy score from images in order to enforce the users’ privacy preferences. Our model is trained to predict the user specific privacy risk and even outperforms the judgment of the users, who often fail to follow their own privacy preferences on image data.